First, buy yourself three Sharpie brand permanent markers. Get the ones with black ink as they seem to work best. Get two fine point (which really has a bullet-shaped medium point in my opinion), and one ultra-fine. The ultra-fine has a steel barrel-tip with a very fine marker poking out the end. Sharpie® fine and ultra-fine point markers. Label your jar of lacquer thinner “Board Cleaner and Etch-Resist Remover”. Next, clean the board very well. I found that automotive rubbing compound works really well for that. It gets really black and messy while you’re doing it, but rinse it off, and voila, shiny copper. After you’ve rinsed it, use some lacquer thinner to get any traces of oil or grease off the board. From this point on, only handle the board by its edges. If you must touch the surface, put something between it and your fingers so you don’t get any skin oils on it. It may be tempting to use sandpaper to clean the board, but don’t do this. You will make millions of tiny grooves in the board, which may not fill with etch-resist, and you’ll get hairline cracks in the finished traces. The next step is to drill the holes. Use a 1/32″ bit. Use a piece of perf-board with holes on 1/10″ centres as a guide, and make sure you drill from the copper side, not from the component side. If any of the holes need to be larger, enlarge them now (eg. with a thicker bit, or a needle file). 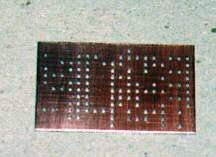 A clean, drilled, and deburred copper-clad board. Now take a 1/8″ drill bit, and by hand, use it to remove the raised ridge of copper that for some reason forms around each hole as it’s drilled. Don’t over do it. You don’t want to make the hole in the copper larger than the hole in the board or it will be no fun to solder, since the component leads won’t be close enough to the copper. Take a loop of masking tape and tape the board, copper side up, to a piece of cardboard (eg. the back of a writing pad). Press it down flat (but don’t touch it with your bare fingers). Now you have a handy means of handling the board and holding it still while you draw the traces on it. Next, draw all the pads. For this I use the larger of the two markers. I generally start by putting the tip of the marker in the hole and turning. This draws a nice circular pad around the hole. After you gain some skill in this, you can run the tip of the marker around the rim of the hole and make a larger pad that way. The rim of the hole will bite into the marker and keep it from sliding all over the board. Keep this particular marker for making the pads, since making the pads tends to wear out the marker tip a bit and it’s no longer so good for drawing traces. With the etch-resist applied and dry, the board is ready for etching. After all the pads are done, using the second large marker, draw all the traces that don’t have to go through tight spaces (like between pins). The traces that you draw should be about 1/16″ wide. Any power or ground traces that are next to the edge of the board should be extended right to the edge of the board (especially if they will be handling motor currents). Now, draw the remaining traces that do go through tight spots. Use the super-fine point marker for this. The super-fine doesn’t seem to put the ink on as thick, so go over each trace a few times. Inspect the board carefully. If there are any areas where the ink looks thin, go over them. Dabbing the ink on with the marker tip works well. Let the board dry for at least 2 hours. The ink is dry to the touch almost immediately, but like paint, it’s still pretty soft for a while. Get a plastic tray whose bottom has about 4 to 8 times the surface area of the board, and put about 1/4″ of etchant in the bottom. Microwave on high for 20 to 30 seconds (don’t let it boil, or someone will be very angry with you). Do not put the board in the microwave!! If you don’t have a microwave, put the whole bottle of etchant in a sink full of hot water for half an hour first. Open it occassionally to relieve the pressure. Place the tray on a table (on some newspaper), with a 1/8″ x 1/4″ strip of balsa under the middle of it to act as a pivot for rocking it. Place the board in the tray, copper side up. Rock the tray constantly while the board etches. It will take about 20 minutes. Finished board, ready to have components soldered in place. When done, rinse the board under running water for at least 2 minutes to get all the etchant off. Then, using tweezers, dip the board in the lacquer thinner and swish it around. Take it out, wipe it off. Do this a few more times to get all the etch resist off. The copper will have microscopic fissures in it and you want to get all the ink out of these or soldering will be a pain. Radio Shack sells a kit, catalog number 276-1576, which contains circuit board material, etchant, etch-resist remover, a Sharpie-like pen, an etching tray, and a 1/16″ drill bit (which is too large). They also sell the etchant separately as catalog number 276-1535. 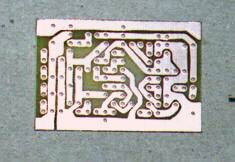 Radio Shack doesn’t sell any single-sided copper board separately, but they have double side board, catalog number 276-1499, which can be turned into single sided by either peeling or etching the copper off of one side. Try not to touch the surface of the copper after etching either or you’ll get oils on it and it will be hard to solder. If you’re not going to use the board right away, wrap it up tightly in plastic wrap to keep it from oxidizing. Clean all component leads. I find the best way to do this is to scrape them with an X-acto knife. They should be as shiny as the board. Use at least a 30W iron. You are much more likely to damage a component with a 15W iron because you need to hold the heat on it longer. Personally, I use a 45W iron. You should also clip an aligator clip onto the lead you are soldering when soldering a semiconductor (transistor, MOSFET, diode, IC). This will prevent excessive heat from reaching the component. A quick note about the Sharpie. I thought I would try the Sanford “Industrial Super Permanent Ink” Sharpie. It says on the pen, “remains permanent under most chemical washes and extreme heat and steam”. They were right beside the regular Sharpie in the store. So I thought “I’ll try the Super Sharpie” figuring it would be more resistent to the ammonium persulfate. The results were very poor compared to the regular Sharpie. I don’t know why. When I tried the regular Sharpie under the same conditions the results were excellent. 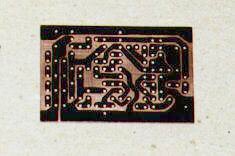 Before I made Stefan’s BatmanII described here on his website I reserached hobby methods for printing circuit boards. I find some sites describing how to transfer the artwork with a laser printer/copy machine on paper to the board. I think that this http://www.fullnet.com/~tomg/gooteepc.htm write up is the best I came across. I used the Staple paper suggested and the transfer came out GREAT! I remember using photo resist coated PCB’s. It was the best PCB’s I had ever made. I exposed the pcb in several places at several exposure rates to find the right one for the bulb I was using to expose with. Developed it then that told me the exposure time to use. It was a snap all I needed was a positive printed on mylar film out of the laser jet printer, I used a 250watt reflector bulb to heat the ferric chloride and a magnetic stirrer which just spins a plastic propeller in the solution. I never did plated thru holes. Photo resist pcb’s can be really professional looking. I do not want to discourage you from making your own pcbs _ I did it for years. There is a side of me that thinks everyone should try it_ part of paying your dues. Just be careful especially when using chemicals. Take every step seriously and do not work in cramped or cluttered conditions. I was recently making pcbs under these conditions and had a nasty acid spill. I decided to give up making my own PCBs (no fun anyway) and started looking for a PCB service. Most places were not much of a bargain for guys like me who use simple designs and just want to order one board sometimes. Most places are charging setup fees, minimum quantities… plus $20 for shipping. I finally found a place that is very reasonable and perfect for my needs (simple one side PCBs – no minimum – no fees – flat rate shipping $4.99) [http://www.CircuitBoardsToGo.com]. They accept all kinds of file types including Eagle pcb software files and plain old .jpg image files. There price for single boards start at $6.30. I don’t have to worry about the danger, mess, waste, workspace, storage space, equipment cost, supply costs… or the time I spend making boards and the failures… I wasted a bunch of money and time trying to find the best do-it-yourself method. I found mine_ it’s send the design and have my PCB delivered then just enjoy the fun stuff. Have fun and no BS just handle PCB chemicals with reasonable care, and don’t let your work space get to cluttered _ E.G. never balance a tray of acid on top of "stuff". DChurch, I’m not sure how you managed to have an acid spill, since there are no acids involved in the process I’ve outlined. You aren’t by any chance affiliated with Circuit Boards to Go, are you? Sounds like an interesting option though. Ferric chloride is an acid. It is only mildly hazardous in the concentrations used for PCB etching. However many of us mix our own FC from a concentrate and that is exceedingly dangerous. Not to discourage anyone from etching their own boards but accurate information is important. It gives very good result to apply in thinner solved resin on the copper side. It protects the oxidation and helps to better soldering. A few years ago I was involved in a college course where we created PC boards and they used the photo-resist option by simply exposing the board through the mask with a standard copy machine. They had disabled the machine so that when they pressed the copy button it would simply run the light across the board (I don’t know if it was more than once) and the board would be ready to go. Unfortunately I don’t remember the details, but it worked well and quickly in their setup. Instead of Ferric Chloride, which you have to dispose of once you use, you can use a solution of Muriatic acid and Hydrogen Peroxide. A detailed guide on this can be found on instructables (http://www.instructables.com/id/Stop-using-Ferric-Chloride-etchant!–A-better-etc/) but the basic idea is 1 part Muriatic Acid, 2 parts Hydrogen Peroxide (Low concentration of Hydrogen Peroxide) and then you can use this indefinitely by bubbling in oxygen from the atmosphere (Use a cheap air pump from a fish store) Muriatic acid isn’t too hard to get, just find a pool store and they usually sell it, Hydrogen Peroxide can be found at most drug stores, and often even dollar stores. Joshua, I’ve heard of a few people mention this technique, but it is extremely dangerous. I have a friend in Denmark who lost a friend this way (i.e. he died), as he was overcome by the chlorine gas produced by the reaction. If you’re going to do this at all (which I do not recommend), do it outside. I also doubt that you can use the same batch of solution forever. The fact that the reaction gives off chlorine gas means that something in the muriatic acid (chemical name: hydrochloric acid) is getting used up, and you’re not going to replace it by bubbling air through it. I was read the theory but there was no detailed found, so please send brief details of the circuitary. I tried in the past the Sharpie marker, but I didn’t obtain good results with it. Perhaps it was because I didn’t let the marker dry for over 2 hours, as instructed in here. I found instead that the marker called Staedtler Permanent Lumocolor (red! ), gives excellent results in a shorter amount of time. Did anybody else try these markers? And here I was going to go buy a laser printer! Down to the stationary shop I go! Thanks alot for this page. In general, this process will not work with ammonium persulphate. Ammonium Persulphate eats away at the ink from the sharpie and you end up with poor results. If you plan on doing this, stick to ferric chloride but personally I am finding this hard to get. I do find that the laser printer transfer method is better though. Even better, if you have an inkjet printer that will print on CDs, you can print directly onto a circuit board (just make a carrier). Just make sure you use the highest quality. If you have an Epson printer and original inks it works very well. I cannot speak for cheap inks. Semiman: I haven’t had any problems using Sharpies with ammonium persulphate. I’ve never tried the inkjet printer idea, since I didn’t realize there even was one that could print on a thick object, or even that inkjet ink would withstand immersion. When it’s time for a new printer, I’ll have to keep that in mind. Stefan, I had tried several markers, etc. and was looking to buy a laser printer. Then I realized my local LIBRARY had a laser. I used theirs for 15 cents a page on photo paper (cheapest you can find). PS. Try the muriatic acid and hydrogen peroxide. Works great and a lot cheaper. Bob, I may try the muriatic and peroxide some day, outside in the summer. If you read through the older comments above, a friend of mine lost a friend who tried it indoors. Thanks for an excellent article. When I was making my PC board, I realized I didn’t have any thinner of any kind. I did, however, have “Groove Juice”, a cymbal cleaner. The stuff was amazing on my cymbals- cleans ’em right off, to a glimmering shine with no rubbing (just like it says on the bottle). Well, what are cymbals made of, you might wonder? Brass. And brass is largely copper… same as a PC board! Well, this stuff worked great. Cleaned my PC board right off, and it’s soluble in water. So you might try that instead of lacquer thinner. …Oh, just Google it to find Groove Juice. I believe it’s available at Guitar Center in the Chicago area. And there are other products like it. I imagine it’s some sort of weak acid. The Sharpie comment from a reader was just what I was looking for. MG Chemical advertises that their marker (Sharpie look-a-like) will not hold up to ammonium persulfate. I was looking for an alternative and this article confirms my suspicion that a real Sharpie will hold up just fine. Thanks! Good article. By the way, CircuitBoardsToGo must have been a good deal; they’re out of business now. …just a detail for the hobbyist. How to clean the PCB board so that the marker pen paint will stick. I tried acetone first but it was not optimum. Then I used my toothbrush and a rather agressive sort of toothpaste (once per week whitening), which they sell as DENIVIT here in Finland. Rinsing with hot tap water and final rinse with destilled water gave excellent results. I asked a chemist why the acetone left greasy stains and he replied that this might be an addition of certain substances to prevent sniffing it as a drug (causing bad feeling). I use automotive hand cleaner, with PUMICE, to clean and polish my PCB boards. The hand cleaner will find regular use and won’t sit in a closet awaiting the next project. I then clean the board with a dish washing detergent for peace for mind, because I don’t know if any oils are used to make the hand cleaner. It’s my understanding that acetone fumes are hard on the kidneys. Ferric Chloride may be kinda hazardous and/or difficult to get a hold of so do like I did. You can mix Vinegar, Hydrogen Peroxide and Table salt to form a Copper etchant. Takes a little bit longer to etch than ferric chloride, but an extremely cheap and easy option…just use 1 part vinegar, 1 part peroxide and a lot of salt, more salt=stronger reaction. I also hear Muriatic Acid (found at local hardware store) works wonders and faster, but it’s a lot more acidic than vinegar so be EXTREMELY careful when using. Muriatic acid in place of vinegar that is. George, see my response to Johsua in 2009 a few comments back. Using hydrochloric (aka muriatic) acid and hydrogen peroxide is extremely dangerous. I use the muriatic/HP method with a laser printer and I have had terrific results…I have etched many boards outside. The fumes are so strong and acrid, that my body does this involuntary refusal to inhale it. I also use over sized goggles and latex gloves, outside in the driveway with the water faucet and hose less than arms reach away. Just from the way it burns my nose and lungs, I’m betting on instant damage to the eyes. Clean your board with a nylon green scouring pad and Ajax (or equivalent)cleanser. Rinse in water. Tip board off horizontal and look for a “water break free surface” ie. looks like entire surface of board has a coating of liquid. The way a surface was prepared for epoxy bonding, or etching in the old aerospace days. For cleaning board I use Ajax with cloth/toothbrush. It works pretty well as abrasive (Powder cleanser) and is nontoxic apart from the usual chlorine. You know where you can buy only the already drilled printed circuit? unfortunately no experience in making spampati. After much trial and error of different methods, I get the best and most consistent results using a vinyl cutter/plotter to lay out the design on the PCB using either an ultra fine point or regular fine point Sharpie and then etching with muriatic acid/hydrogen peroxide. For best results with the ultra fine point Sharpie, I trace the design over itself three times. Then I let it set up for at least 5 or 6 hours before etching. I also find that it is helpful to use a little less than the recommended 1 part acid to two parts HP. This of course slightly slows the etch but it still goes pretty fast regardless. I also keep my etching container in a larger container of hot water to keep the solution warm, and I use an aquarium pump with a bubble wand to aerate the etching solution. I also attach a couple of pieces of styrofoam to the back surface of the PCB with electrical tape or even elastics to keep it floating face down in the solution. The action of the bubbles seems to scrub the surface gently without abrading it at all; a typical 2″ by 6″ card will easily etch in two or three minutes, and I find that I can usually do up to four PCBs in succession before the solution significantly slows. From what I have read about this method, it appears that the additional oxygen provided by the aeration helps a lot. If I have still more PCBs to do, I add a small amount of acid after the fourth PCB. I do not store the spent etchant; as I only do PCB making on occasion and I usually try to plan to have several to do in one etching session. Anyhow, I find this to be the most consistently repeatable method that gives very good results with traces down to one mm. Previously I tried ironing photo paper with the circuit printed on a laser printer, but the results were very inconsistent and it was very difficult to get small traces. I would always have to go back over it numerous times with a Sharpie anyhow, not to mention dirtying my wife’s clothes iron. Vinyl cutters are used by sign makers, and there are many different models available for under $300.00. You can use a number of different CAD programs to make your circuit design and the particular vinyl cutter I use requires the final design to be in the PNG format. So far, I have not found an easier or better way. Results are consistent, very good, finely detailed and actually kind of fun to do as well. Perhaps the most important thing is tracing the ultra fine point Sharpie three times and then giving it 5 to 6 hours to set up, and likewise a little less acid, probably more like 7:2 for peroxide and muriatic rather than 2:1. One thing I did find, however is that the new “green” muriatic that fumes less and doesn’t smell as strongly seems to have ingredients that will degrade the Sharpie ink a lot faster. The standard type is definitely preferable. Needless to say, keep safety always in mind; take your time, plan each step carefully, wear goggles, chemical resistant gloves, do it outdoors, don’t breathe the fumes and be ever mindful that this activity does involve dangerous chemicals. Keep kids and pets away! The muriatic/peroxide mix will degrade Sharpie ink in time; the thing to keep in mind is that if this is going well, the etch will be completed well before the Sharpie ink has degraded enough to fail. I did try the vinegar/peroxide/salt method also, but by the time the copper has etched, most of the Sharpie ink will have degraded as well, so in my opinion, that method is not satisfactory. Perhaps with a different resist it can work, but if you are using a standard Sharpie, it is too slow to be beneficial. If I were doing this frequently, I’d send my designs off to a PCB fabber, but I only do this a few times a year and thus the above method is perfectly satisfactory for my needs. Ferric chloride won’t dissolve any plastics. I just tried the regular sharpie perm, marker. Left it dry for bout an hour-ish, then used Ferric Acid – results were excellent.